The two suspects (left and centre) being taken to the police station for further action. MIRI: Two men, suspected of stealing the gate of a house here, were arrested by police on Sunday evening after a CCTV footage of them carrying away the gate as they sped off on a motorcycle went viral on social media. 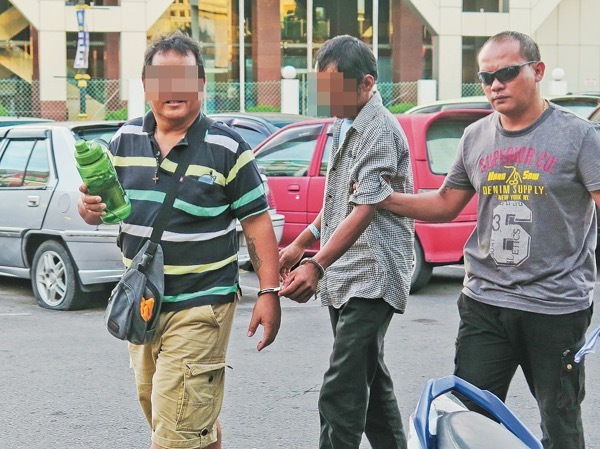 Miri District Deputy Police chief, Superintendent Standley Jonathan Ringgit said the duo – a father aged 55, and his son aged 25 – were arrested in Tudan at about 5pm. He said police also seized a Yamaha motorcycle believed to have been used during the crime. “During our initial investigations, the 25-year-old suspect claimed that the motorcycle key had been taken away without his knowledge by a man he knew on 20 May. “Police are now looking for the man who is believed to be involved in the crime,” added Stanley. He said the father and son were being detained at Miri Police Station for further investigations under Section 379 of the Penal Code. The footage of the thieves with the gate taken from a house at Jalan Tudan Sunlight Garden 5 was captured by the CCTV of a neighbour who lived opposite the victim’s house. The house owner only realised his gate had been stolen after being informed by the neighbour at about 5.55pm on Saturday. The house was unoccupied and vacant because the victim was still living in his old house at Pujut 7. The theft happened in a new housing area occupied only by a few residents. Father and son nabbed over gate theft 0 out of 5 based on 0 ratings. 0 user reviews.